National Night Out occurs in neighborhoods across the country on the summer evening of August 7. National Night Out is all about taking back our streets and public parks for a fun multicultural gathering that celebrates neighbors, the outdoors, and in our case, East Bayside! 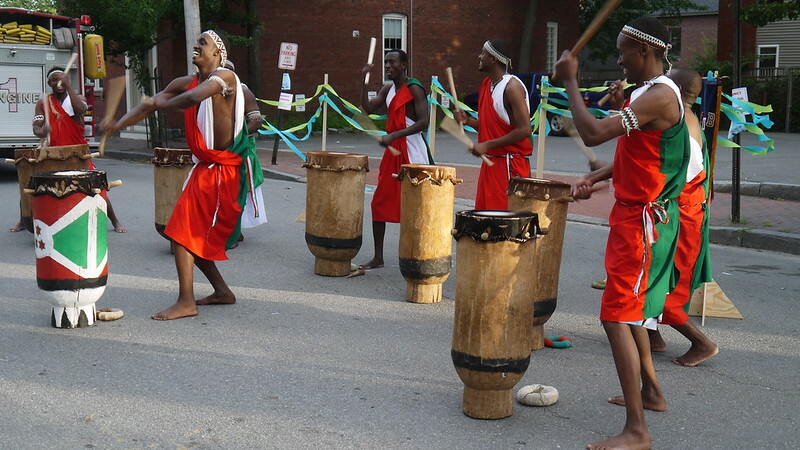 It all starts with a parade from Mayo Street Arts at 6pm, winding through Kennedy Park and East Bayside to Fox Field for a free BBQ, performances by youth and local musicians, including puppetry by Shoestring Theater and traditional Rwandan dance and drumming by Ikirenga Cy’Intore. Guest speakers TBA. Meet and mingle with neighbors, listen to live music, and celebrate the cool vibrant place that is East Bayside! Brought to you by Mayo Street Arts, Portland Community Policing, the Root Cellar, EBNO, Portland Housing Authority, Opportunity Alliance, Boys & Girls Club of Southern Maine, and Target. Sponsored by: Coffee by Design, Rising Tide, Redfern Properties, and The Big Apple.